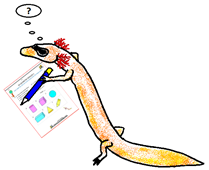 Welcome to the 2nd Grade Math Salamanders Free Geometry Worksheets page. Here you will find our range of free Geometry riddles for elementary kids from 1st to 5th grade. These fun riddles will help your child to develop their 2d and 3d shape skills and language, whilst developing their problem solving and reasoning skills at the same time. During 2nd grade, children are introduced to a wider range of 2d and 3d shapes. Children also start to look more closely at the properties shapes have to categorise them. Symmetry is introduced at this level, and children learn to find lines of symmetry by folding shapes or using mirrors. Children are encouraged to look more closely at shapes to recognise the differences between how the shapes are made up. Curved sides and straight sides in 2 dimensions, and curved and flat surfaces in 3 dimensions are identified. identify a shape which has been flipped or folded. The worksheets on this page involve solving a range of geometric problems by solving riddles. Each worksheet contains 2 riddles and between 6 and 9 shapes. Each of the riddles has 3-4 clues which only one shape on the sheet is able to fulfill. Probably the best way of using the sheet is to get your child to work their way through the clues, crossing off the shapes that do not fulfill the criteria in the clue. You should eventually end up with just one shape which fulfills all the criteria. If you use different colors for each of the riddles, then you will not get muddled up with the shapes you have crossed out. The clues contain information about the properties of the shapes, such as the number of sides, right angles, length of sides, and lines of symmetry. improve their knowledge of the properties of 2d and 3d shapes. Children could write their own set of clues down to identify one of the shapes. Looking for some easier worksheets? These worksheets are at an easier level than those on this page. They will help you to learn the properties of 2d shapes. The worksheets on this page are all about identifying different 2d shapes. The main focus is on identifying triangles, but other 2d shapes are also explored. recognise 2d shapes in different orientations. This webpage is all about identifying different transformations for 2d shapes. Using these sheets will help your child to explore and identify different transformations that can be done on 2d shapes. Here you will find our 3d shape worksheets for second graders. The sheets involve naming and noticing some of the properties that 3d shapes have. categorise the 3d shapes by different criteria. All the sheets in this section will help your child to become more familiar with many of the 3d shapes around them, and learn about some of their properties.